I'm getting pretty sick of anonymous police sources mouthing off in the media. That mood is not assisted by the topics they choose to complain about. There is a saying "No police officer ever met a new power he didn't like." That's not universally true, of course. In fact, in recent years, some police officers have shown remarkable sense in pursuing smarter, rather than harsher, ways to deal with crime. 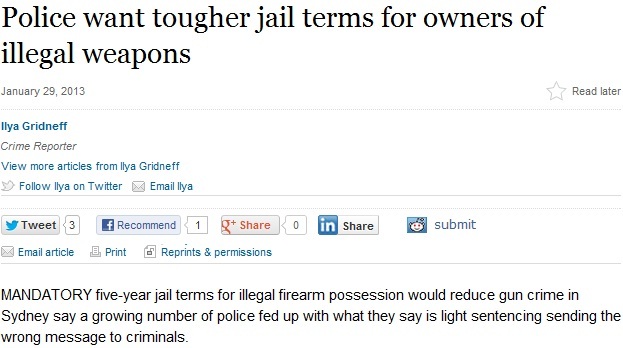 No doubt they were able to point to extensive research that proved that such a change would reduce gun crime. Or at least some evidence that it was the best way to deal with the issue? First there are two examples of sentencing, presented without any context whatsoever, meaning the reader has no way of knowing whether the sentence was appropriate or not. This is a constant issue with media reports that, frankly, one has become more accustomed seeing in the Terrorgraph. I'm sorry, but if you're going to make such a definitive claim without a shred of evidence to back it up, then you're flat out lying to achieve a political goal. To reduce the New York Zero Tolerance experiment to "zero tolerance penalties on gun possession" (what even does that mean?) is to grossly distort history. The changes in New York were wide ranging and encompassed a fundamental shift in policing in New York. Sentencing was a very discrete and comparatively insignificant part of the changes. These police officers are launching a cowardly, anonymous attack in the media without a shred of evidence to back it up. In fact, the only sensible suggestion in entire piece (the government having either not suggested one or not having had it quoted) comes from John Robertson. A guideline judgment is a decision from the Court of Criminal Appeal that sets out a framework for sentencing an offence. At present we have a number of guideline judgments in operation, including for High Range Drink Driving and Armed Robbery. If the Attorney General sought such a judgment, and the court was satisfied that it was appropriate, a framework for sentencing persons convicted of gun possession could be handed down. It would be something along the lines of "A person convicted of XXXX should in the ordinary case be facing a term of imprisonment of between three and five years." Alternatively, the government could impose what is known as a Standard Non-Parole Period - a period of time that should be imposed on a mid-range example of an offence. By way of example, the Standard Non-Parole Period for Murder is 20 years, whilst for Sexual Assault it is 7 years. Of course, that all assumes that the penalties being imposed are actually insufficient, and no one quoted in this piece was actually able to prove that. Until someone does, this piece remains little more than a baseless attack on the legal system.